Born to the Italian nobility. Studied law and medicine at Bologna, Italy, receiving a law degree in 1556. Mayor of Felizzano, Italy. Judge. Chief tax collector in Alessandria, Italy. Mayor of Cassine, Italy. Mayor of Castelleone, Italy. Superintendent of the fiefs of the marquis of Naples, Italy. Following a retreat, he became a Jesuit in 1564, and was ordained in 1567. Novice master in Naples, and then was sent to found a college in Lecce, a small city in the south of Italy. He quickly became the most loved man in Lecce due to his concern and charity. He made himself appear the receiver rather than the giver, and the poor and galley slaves were his special concern. One of the more interesting miracles attributed to him concerned his small pitcher of wine which was never empty until everyone present had had enough. On Bernadine's death bed, the city's magistrates formally requested that in the after-life he take the city under his patronage. Unable to speak, he nodded, and died soon after, whispering the names of Jesus and Mary. Son of Guy of Luxembourg, count of Ligny, Belgium. Orphaned at age four. Raised in Paris, France. Canon at Notre Dame, Chartres, and Cambrai. Arch-deacon of Dreux, France. Held for a while in his early teens by the English as hostage for the return of his brother. Bishop of Metz, France in 1384 at age fourteen. Created cardinal of San Georgio, Velabro in 1386 at age sixteen by decree of anti-pope Clement VII, he used armed troops to take possession of his see, fighting against the forces of Pope Urban VI. A noted reformer of his diocese, known for his personal austerity and penance, his prayer life, and genuine piety. He was driven from Metz and joined Clement in Avignon where he died, still in his teens. Thrown into the politics of the state and of the Church during a period of schism; Peter was wholly unequipped for it, being a child, and a simple one at that. He chose the wrong side in the dispute over the papacy, but was immediately recognized for his personal holiness. Fourth of eight children born to wine-makers Pietro Joubert and Antonia Celle; she was baptized on the day she was born. Educated at the Ursuline boarding school at Ministrel, France from 1881 till 1887, and then at the College of Saint Mary in Le Puy, France, run by the Sisters of Notre Dame, from 1889 to 1892. Made her First Communion on 29 May 1887. Taught catechism to local children. She joined the Sisters of the Holy Family of the Sacred Heart at Aubervilliers, France at age 19 on 6 October 1895, and made her profession on 8 December 1897. Assigned to be a catechist in Aubervilliers where she worked with poor children to prepare them for their First Communion. Sister Eugenie contracted tuberculosis in 1902. Assigned to Rome, Italy, then moved to Belgium in May 1904, but died soon after. She was known for a great devotion to the Blessed Virgin Mary, and for boundless care for the children in her charge. Raised in an abbey. Priest. Chaplain to Egbert, King of the West Saxons. Tutor to prince Ethelwolf. Bishop of Winchester, England. 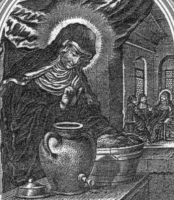 Miracles associated with his relics. His shrine was destroyed during the Reformation. Almost 60 ancient British churches were named for him. Benedictine monk. Abbot. Drained the Pontine marshes in Italy. Founded an abbey in Sezze in the Papal States (part of modern Italy). She married young, and was the mother of two daughters, both of whom died in childhood, sending Monegundis into a deep depression. She eventually overcame her grief by filling the empty space in her life with God. With her husband's agreement, Monegundis became an anchoress, and built a private room where she could devote her life to solitude and prayer. After several years of this life, Monegundis moved to Tours, France, and built a hermitage near the tomb of Saint Martin of Tours. She soon gained a reputation for holiness, other women joined her in solitude and prayer, and they built a convent dedicated to Saint Pierre le Puellier. Brother of Blessed Giovanni da Fabriano Becchetti; related to Saint Thomas Beckett. Augustinian priest known for his education, wisdom, personal piety, deep prayer life and preaching. Studied in Padua, Italy in 1385. Taught at the Augustinian school in Rimini, Italy. Professor of Sacred Theology in Venice, Italy. Pilgrim to Jerusalem. Built a chapel similar to the Holy Sepulchre of Jerusalem at the Augustinian church in Fabriano, Italy. Brother of Blessed Thomas Becchetti; related to Saint Thomas Beckett. Augustinian hermit. Taught in Rimini, Italy in 1385. Taught at Oxford, England, and at the same time received a degree in theology from there. Prison guard at the Mamertine prison in Rome, Italy. Worked with Saint Processus. Guarded Saint Peter the Apostle and Saint Paul the Apostle when they were imprisoned in Rome. Converted to Christianity and baptized by them. Tortured and executed in the persecutions of Nero. Martyr. Educated by Premonstratensians at the Mönchsrot monastery in Memmingen, Germany. Premonstratensian monk. Canon of the Bad Schussenried monastery in Biberach, Germany, making his solemn vows on 17 April 1717. Studied theology in Dillingen, Germany. Ordained on 6 January 1721. Professor of theology and philosophy while serving as prior of his house and novice master. Parish priest in Eggmansried, Germany from 1749 to 1755. Noted writer on spiritual matters. Prison guard at the Mamertine prison in Rome, Italy. Worked with Saint Martinian. Guarded Saint Peter the Apostle and Saint Paul the Apostle when they were imprisoned in Rome. Converted to Christianity and was baptized by them. Tortured and executed in the persecutions of Nero. Martyr. Premonstratensian monk. Canon of the Mariegaarde monastery in Hallum, Friesland (in the modern Netherlands). Priest. A pious and well-educated man, he was known as a poet, a writer of biblical commentary, and a popular preacher. Parish priest in Grijn where he had a special ministry of teaching children. Chosen abbot of Mariegaarde monastery on 14 September 1238. Son of a local leader in Brittany in France, he was dedicated to God at birth by his parents. Nephew and student of Saint Theliau. Grew up in Wales. Monk. 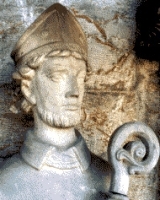 Abbot of Llandeilo Fawr, Carmarthenshire, Wales. Third bishop of Llandaff, Wales c.580. Mauric, king of Glamorgan, assisted him in his ministry, but Oudoceus excommunicated him for assassinating a prince named Cynedu. Joined the Jesuits in 1646. Priest. Missionary in Canada, working with the Onodaga, Cayuhoga and Mohawk. Established a mission on Isle La Motte in present day Vermont. Believed to have brought as many as 10,000 locals to Christianity. Seventh-century parish priest in a small village in the Brie region of France. Three soldiers who were converted at the martyrdom of Saint Paul the Apostle. Then they were martyred, as well. We known nothing else about them but their names - Acestes, Longinus and Megistus. A group of seven Christians tortured and murdered in the persecutions of the Arian Vandal king Hunneric for remaining loyal to the teachings of orthodox Christianity. They were some of the many who died for the faith during a period of active Arian heresy. - Boniface, Liberatus, Maximus, Rogatus, Rusticus, Septimus and Servus. A group of ten Christians marytred together in the persecutions of Diocletian. The only details about them to have survived are their names - Ariston, Crescention, Eutychian, Felicissimus, Felix, Justus, Marcia, Symphorosa, Urban and Vitalis. A group of eight Christians who were martyred together as part of the lengthy persecutions in Korea.